Galleria dentists know how sleep apnea affects the health and wellbeing of patients. According to sleep experts, the average healthy adult requires between 7 to 9 hours of sleep per night. Those under the age of 17 often need more sleep than that. Unfortunately, however, obstructive sleep apnea interrupts a person’s regular sleeping schedule in a manner that can have a negative impact on his or her daily life. Sleep apnea is a chronic condition that concerns many dentists in the Galleria area. The most common type of sleep apnea is obstructive sleep apnea (or OSA). What makes OSA particularly scary is that it causes a person’s upper away is become partially or completely blocked while he or she asleep. As a result, one can stop breathing for an approximate period between 20 to 40 seconds at a time. During these periods of shallow or paused breathing, a sleeper might snore, choke or snort throughout the night. OSA can result in feelings of tiredness or in a lack of concentration in the short term, as well as make one vulnerable to serious health conditions in the long term. 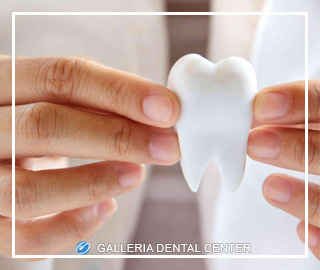 Treating OSA and other forms of sleep apnea is vital to any Galleria dentist who works at our clinic. Oral and maxillofacial surgery and sleep apnea devices are among the medical options we offer for patients with sleep apnea. In order to diagnose OSA, a sleep dentistry specialist will run a series of tests. If it’s determined that the patient suffers from sleep apnea, the dentist will then inform the patient. From there, a Galleria dentist will recommend the appropriate medical options for sleep apnea. These options may either include either a consultation with one of our highly trained oral and maxillofacial surgeons or the use of an oral appliance such as a sleeping mask. The purpose of the oral appliance is to open up the patient’s airways while he or she is asleep. Oral appliance therapies have been found to be an effective and comfortable way to eliminate OSA, snoring and other sleep related problems. Not only have these devices received FDA clearance, many of them are covered by most medical insurance plans. In summation, we hope you’ll bring your sleep apnea issues to our dedicated Galleria dentist team. To learn more about the effects of OSA and how we can help, contact us today to schedule an appointment.